Smart way of living has become a trend these days. Smart home solutions and smart devices everything are on trend. If you are one such a smart home enthusiast, then Cyfrodom has got some amazingly brilliant solutions for your smart home. 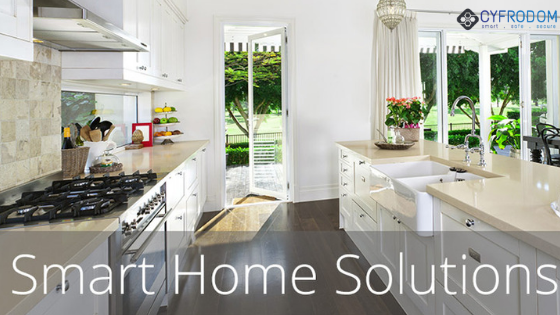 Turn every part of your home smart and make every task you do automatic and connect it with smart systems to make your life more and more comfortable and affordable as well. Fingerprints are unique for each and every person. Our fingerprints have become our source of security in the recent times as we are securing our devices, phones with our fingerprints as they allow us to secure our devices and protect our privacy. Unlocking devices with just a tap of our fingerprint is definitely the easiest thing to do. It can be done in no time and very easily as well. These hi-tech curtain controllers not only elevate the appearance and interiors of your home, but also protect your privacy. Decorate your home in a smart way and make privacy your utmost concern. Home theatre is dedicating a separate space in your home exclusively for watching movies, shows with your friends and family. This can be a lot of fun if you are an entertainment lover and crave to watch movies. Cyfrodom has been offering its users highly efficient and cost affordable home theatres, audio-visual rooms. The Cyfrodom offered home theatres allow you to enjoy your favorite movie at the convenience of your own sweet home and thus make your family time more fun filled. Smart home solutions from us not only offer you the best experiences but also come with great after installation services.